The best thing that you can do is stock up on basic hygiene supplies now so that you don’t need to improvise later. While it is completely possible to bathe in a river, lake or the sea, chew on certain plants to brush your teeth or use leaves to clean yourself after using the toilet, having standard supplies on hand will make life a lot easier. Make sure that you have staple items such as soap, toothpaste, toilet paper hand sanitizer and antiseptic in your stockpile, bug out bags and survival kit. You don’t need a lot, and the more that you can gather now will make life a lot easier later. You can put together enough supplies to last a couple of weeks by placing items in smaller containers and condensing them. Consider taking some baby or sanitary wipes to wash key areas of the body when water is scarce. Bathe in the rain when it falls, and feel free to skip using shampoo because our hair really doesn’t need it anyway. While these things may seem incredibly uncomfortable, taking steps to conserve resources and focusing on the essentials can go a long way during a crisis. One of the biggest challenges you will face is keeping your living area and perimeter free from trash and waste. Not only can these items pose a health risk, but they can also attract unwanted rodents and other scavengers that can transmit disease. The best thing to do is to separate your trash into two piles. Make one for items that can be burned and another for items that need to be buried. Burn anything that is organic. This includes paper, food, non-plastic or chemically-treated items. Bury everything else, but make sure that you dispose of trash far away from your living area. Residents in some communities in California are being asked to avoid flushing the toilet after each use due to the prolonged drought that is impacting the area. While this may seem disgusting, the reality is that you can save an enormous amount of water by waiting until it is absolutely necessary to flush the toilet. This is particularly important when you need to dip into your own water supplies to clear the toilet. 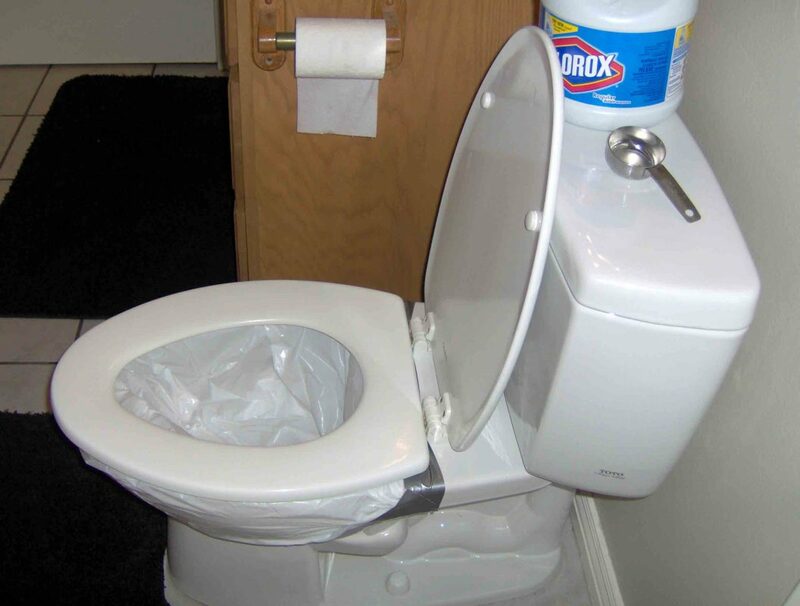 Another useful trick is to place toilet tissue in a plastic bag instead of in the toilet. This is common practice around the world in areas where sewage systems are not designed to handle large wads of toilet paper. Once the bag is filled, take it outside and incinerate or bury it. This alone can reduce the number of times that you need to flush the toilet in addition to minimizing the chances of dealing with clogs or toilets that overflow. One essential supply that is often overlooked is face masks. Get yourself a box or two of high-quality disposable respirators that are designed to filter out small particles in the air. This is especially important if you are dealing with a SHTF situation in an urban area or where a lot of people are congregating. Good face masks will reduce the chances of inhaling contaminants that are commonplace in unsanitary locations, and they are worth their weight in gold as you trudge through areas where garbage is piling up and bathing is uncommon. One of the best places to be during a SHTF situation is in the middle of nowhere. Aside from the security risks associated with being in populated areas full of desperate and unpredictable people, crowds pose a serious threat to your health as well. The less contact you have with other people will minimize your chances of being exposed to communicable diseases and other contaminants. When you do need to be around others aside from your family or group, make sure to wear a face mask, gloves when possible and keep physical contact to a minimum. Wash your hands when possible, use sanitizer or sanitary wipes to minimize the chances of exposure to germs, bacteria, viruses or other contaminants. These are just a few examples of simple things that you can do to stay as clean and maintain a sanitary environment. They also illustrate the importance of being mindful of your surroundings and taking steps to minimize risk. Consider how to use these and other ways to keep yourself and your living area as clean as possible. With a little bit of planning, some sacrifices and common sense, you can avoid a host of problems associated with SHTF hygiene issues.